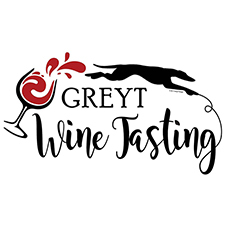 Date/time: Sunday, September 16, 2018 / 1:00 p.m. – 4:00 p.m.
Come enjoy a glass of wine at one of the most picturesque vineyards in the region and celebrate retired racing greyhounds! Proceeds will go to GPA-WI to help cover costs associated with finding caring and loving homes for greyhounds. You’ll enjoy wine and hors d’oeuvres from the award-winning Elmaro Vineyard near Trempealeau. Voted 2016’s Wisconsin Winery of the Year, this family-owned vineyard began in 2006 and is nestled in the Mississippi River Valley. On top of wine and hors d’oeuvres, Greyt Wine Tasting guests will enjoy door prizes and a special grand prize! You’ll also be able to meet some adorable and loving greyhounds and find out what wonderful, affectionate pets they can be! This is a greyhound-friendly event. Bring along your greyhound to mingle outside with you! Due to the high prey drive of some greyhounds, please do not bring small dogs to this event. You can purchase your tickets in advance online at https://www.eventbrite.com/e/greyt-wine-tasting-tickets-48152856490. Free wine glass included with tickets purchased in advance! Free wine glasses cannot be guaranteed for at-the-door registrations. Not able to attend, but want to help? You can still help support GPA-WI by making an online donation. Visit https://www.eventbrite.com/e/greyt-wine-tasting-tickets-48152856490 and click “tickets” to donate.